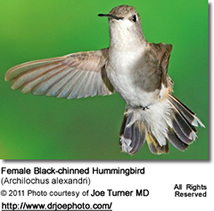 Following listed (with photos) are hummingbirds found in Washington, D.C. / District of Columbia. 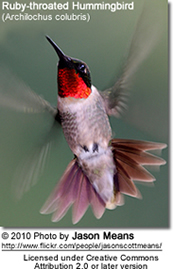 Many hummingbirds favor red blossoms with a tubular shape (but some species prefer other colors). 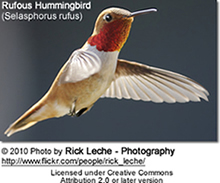 Hummingbirds feed readily on pink, blue, orange, peach and purple flowers. 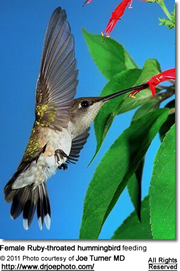 Hummingbird Mints -- (Agastache cana and Agastache rupestris / Agastache 'Acupulco Salmon and Pink' ) - Perennial; grows quickly; very fragrant. Flowering Maple (Abutilon sp.) - Not cold resistant. Only survives the winter if brought indoors. 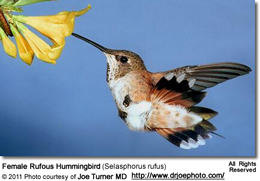 A prolific bloomer with lots of nectar. A favorite feeding plant. Cross Vine (Bignonia capreolata) - evergreen. Orange-red flowers bloom during May and June.